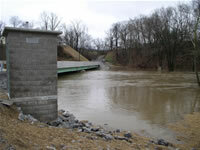 LOCATION.--Lat 40`49'01", long 80`14'33", Beaver County, Hydrologic Unit 05030105, on right bank at downstream side of highway bridge at Hazen, 0.3 mi upstream from Brush Creek, 4 mi southeast of Ellwood City, and 6.0 mi west of Zelienople. PERIOD OF RECORD.--October 1919 to current year. Monthly discharge only for some periods, published in WSP 1305. June 1915 to September 1919 (gage heights and discharge measurements only) in reports of Water Supply Commission of Pennsylvania. Published as "at Hazen" 1915-16, 1929-63, and as "near Hazen" 1917-28. GAGE.--Water-stage recorder. Datum of gage is 852.31 ft above National Geodetic vertical Datum of 1929. Prior to June 23, 1941, non-recording gage at same site and datum. COOPERATION.--Station established and maintained by the U.S. Geological Survey. Funding for the operation of this station is provided by the Pennsylvania Department of Environmental Protection, the U.S. Army Corps of Engineers, Pittsburgh District, and the U.S. Geological Survey. Supplied by NWS: Action stage-8 ft; Flood stage-10 ft; Moderate flood stage-14 ft; Major flood stage-18 ft.